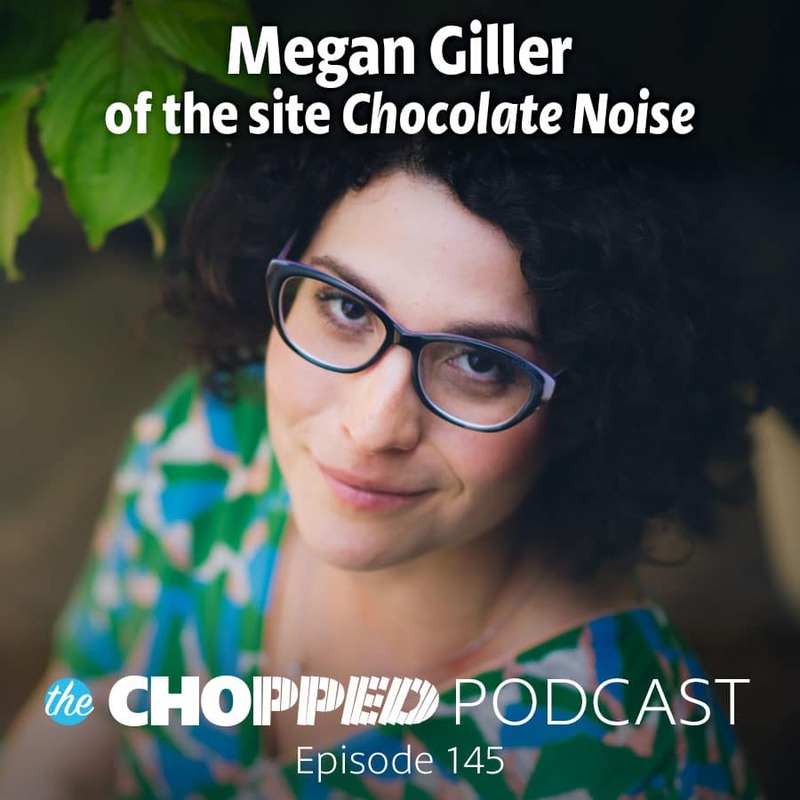 It may seem counter-intuitive that you can expand your audience by going niche, but today’s guest, Megan Giller, was nominated for a Savuer Award for her very niche blog Chocolate Noise, and now she’s written a book on the topic as well. 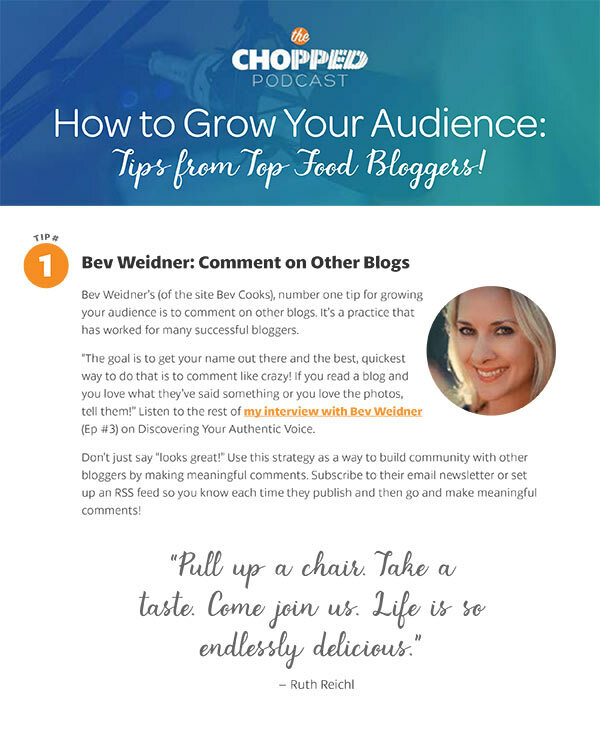 If you’re interested in more discussions on niche blogging, listen to me talk with Bridget Edwards about Growing Your Niche Blog. And you’ll absolutely love my discussion with Kay Featherstone on Building Your Food Blogger Tribe. So much goodness there! Yes, today we are going to be talking about Going Niche, but before that let’s talk about how you can support the Chopped Podcast! Contribute to the Chopped Podcast on Patreon! You can help support this podcast for as little as the cost of a cup of coffee each month. I’m sure you can tell, we work hard to provide you with topnotch information each month on the inner workings of food blogging. Our goal? To help you be your best in an industry that’s both challenging and competitive. Each week we deliver to you interviews with other food bloggers — like today’s coffee talk chats where you can imagine we’re sitting at a coffee shop, talking food blogging! We also reach out to the best experts to deliver industry experts to keep you up on your game! Thanks to everyone who supports the show — we appreciate you. Every day take a moment and say a positive affirmation like: I am supported by the work I love. Or you can say, I receive all the good life has to offer me. Take several deep breaths. It’s easy to forget, but it makes a big difference in reducing stress which is important for you to be your best. Meditate. Even just five minutes a day can keep you centered. Here’s a story for you: I hadn’t been sleeping well the last couple of days because I just had so much racing through my mind and then I realized I hadn’t been meditating. It’s like I get so busy that I think I don’t have time. But when I made time for meditation then I finally slept well again, all through the night. And then I was able to be more productive the next day. See? It’s worth taking a few minutes. I use the app Headspace and Breathe and they offer a few free meditations. It really works! Walk. Even on super busy days, finding time for a walk will help you clear your head and deliver the best to your audience. There you have it, my quick tips on being your best for the busy food blogger holiday season! I released a survey recently, on how food bloggers use Pinterest. You know I love processes. I just really enjoy understanding how people do their work. So this is your chance to share the ways you use Pinterest as a food blogger. Soon I’ll do a post sharing the results of that survey. And the good news is, one survey respondent will receive a free pass to participate in our upcoming Chopped Academy Pinterest Course. That’s right. We’re creating courses. And they’re not like any courses you’ve seen before. We’re actually engaging presenters who are in the field doing the work and kind of peering over their shoulders, seeing how they do the work they do. You can use these courses to refine your workflow and feel confident about the way your getting the work done. We’ll start with a course on Pinterest and will have one to release on Instagram very soon. And we’ll have more webinars coming up soon. It’s all very exciting and informative material to help you be your best! To make sure you’re in the know about everything that’s going on, sign up for the Chopped Academy newsletter at chopped.academy and scroll down to the bottom of the page to fill out the form. OK. Let’s get to today’s episode. Today I’m talking to Megan Giller. She’s with the site Chocolate Noise (see link below). I like just about everything to do with chocolate, so I was excited to talk with Megan. Megan has a very different model as a food blogger, because she doesn’t actually publish recipes. The focus of her site is on chocolate and she interviews chocolatiers and talks about a subculture within chocolate called bean to bar. Talk about going niche! Megan talks about the benefits of going niche, including the fact that her site was nominated for a Savuer Award.And now she’s published a book based on the topic of her blog as well. Going niche has its advantages. I think it’s such an important topic because it’s an example of how when you take on a topic and really own it, you can really do great things. So, it’s tempting for us all to want to do it all. I definitely feel that call as well. But there can be great rewards for going niche and really drilling down into a topic. A few years ago we did the Food Blog Success Summit where several food bloggers were invited to present their sites to an expert panel and receive feedback. It was a great workshop and I definitely have thought about doing it again someday. One story stood out to me. There was one blogger in particular who had a very specific theme to her site, but she wasn’t really happy with the results. Her proposed solution was to expand her topic into other areas, but we suggested she do the opposite and own her topic even more. Drill down deeper. Become the go-to resource for that topic. That is why we’re talking about going niche on today’s episode. It happens to be that Megan writes on something we all love, chocolate. You will be intrigued by Megan’s knowledge of chocolate and we definitely talk about that as well. I loved today’s discussion with Megan Giller and I hope you will to. Related Post: Listen to Christine Pittman talk about the Best Food Blogging Post Development Process ever!